Natacha Ramsay-Levi’s third runway season for Chloé was a lot different from the first two, but felt distinctly like her. That’s already a sign – this woman has her own, complex style that she develops and develops, without losing some sort of personal idiosyncrasy. For spring-summer 2019, the designer investigated her more eclectic aesthetic. Think breezy, summery feel with 70s prints, amulet jewels and flowy dresses. The collection had something nomadic about it, but Natacha escaped the clichés of boho style. Tie-dye t-shirts worn with fringed miniskirts looked festival-ready, while the scarf tops, pants and dresses looked light and easy. There were also rope belts; paisley patterns all over silk pantaloons; knitted pullovers worn over loosely fit, crotchet blousons. Ramsay-Levi respects Gaby Aghion’s (Chloé’s founder) liberated femininity that was never based on regular ‘prettiness’ or specific beauty canon. The current Chloé designer’s femininity is equally strong and multi-faceted. While others do princess dresses for the closing look, Natacha sent down a pleated, maxi-length gown suited for a Goddess (note that gorgeous collar and the Grecian bracelets). To sum up: the ready-to-wear is completely desirable, the accessories are on point. With this collection, Ramsay-Levi proves once again that she’s a skilled designer, who’s capable of creating a consistent, yet simultaneously exciting vision of the brand. This seems to be shockingly rare in the industry, especially when you browse the majority of this season’s line-ups. Bravo, Natacha! 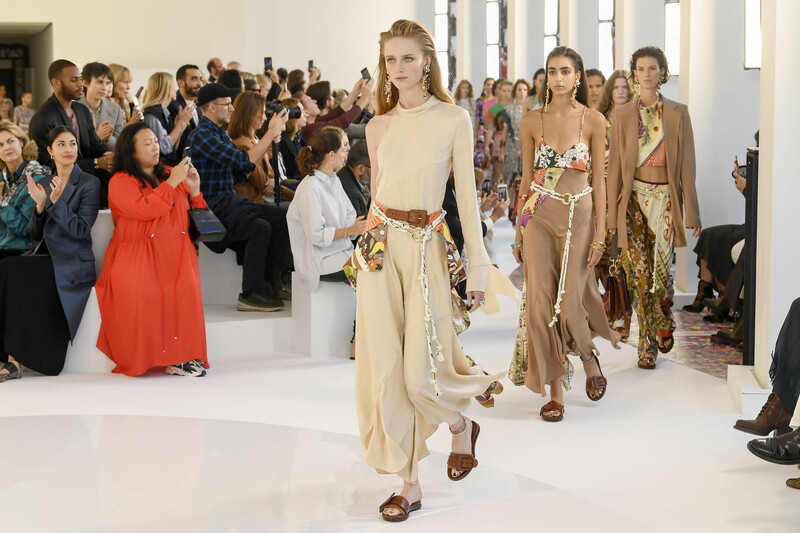 This entry was posted in Paris, PFW and tagged Chloe, Gaby Aghion, Natacha Ramsay-Levi, pfw, SS19. Bookmark the permalink.